Advantages compared to conventional signal flares: According to the manufacturer, the shortest lighting time for the Odeo Flare is well over five hours. This is a huge plus over the burning time of the 30 seconds to one minute of standard pyrotechnic hand torches. In addition it can be equipped with standard batteries, so they can be easily sent by conventional mail. In addition, as heat cannot develop without fire, there is no danger of hurting yourself or others. We have tried in practice whether the luminosity of the diodes and lasers is actually enough to locate a distressed yacht. The results can be read in the current issue of the magazine YACHT 23/2017 which has been available from the 2nd of November. Most sailors still have pyrotechnical Hand Flares on board to attract attention in an emergency. However, there are now good alternatives that work with electricity and we have tried four. It could have ended badly. On June 10 this year there were violent thunderstorms on the coast of the German Baltic Sea. An eight-meter-long catamaran ran into the storm in the eastern Greifswalder Bodden in the evening. The boat capsized, and the crew, a 55-year-old father, his 23 and 20-year-old sons and a border collie, could only rescue themselves staying at the hull of the boat. There they linger during the night until they were spotted in the morning by a yacht and finally recovered by the Sea Rescue. The sailors could not attract attention in the dark because both distress tools and cell phones were lost during capsizing. A hand torch would have been enough to call for help – the shore was less than two miles away. This distress shows impressively how important visual signals can become if e.g. radio and smartphone fail. Some manufacturers now offer signal flares with LED instead of pyrotechnics. As our test with four products has shown, these are very easy to identify even from long distances. In addition they offer even some advantages over conventional signal flares: The shortest light duration, according to the manufacturer, is the Odeo Flare with over five hours. This is still a huge plus over the burning time of 30 seconds to one minute of pyrotechnic hand torches. In addition, two of the four tested LED torches can be recharged with AA batteries. Another advantage of the batteries is that the LED and laser flares can be sent easily by post. In addition, as heat cannot develop without fire, there is no danger of hurting yourself or others. In the worst case, pyrotechnics can even set fire to the boat or liferaft – the electric variant is completely harmless in this respect. Last but not least, the handling can be easily practiced by switching on the LED hand torch and after a test it is of course still usable. Two rescue lasers from Greatland and two LED flares, one from Ocean Signal and one of Daniamant were tested. To get a realistic impression, the test took place at night. There were two people in Gelting on a jetty, and the electric flares were tried on a yacht, which moved away from the pier. To make differences clear, handheld flares and lasers were tested once at 0.25 nautical miles distance and then at a mere nautical mile away from the mole. On the photos taken with long exposure time the outlines of the boat are still to recognize. It was communicated by phone which signaling device was currently used on board to document the differences. And they were clear and appeared systemic between the lasers and the flares. The rescue lasers from Greatland were available for the test in the versions Light and Magnum. However, the larger Magnum variant has a larger battery capacity and thus a longer burn time; in brightness it was identical with the Light version. The lasers produce a bright stripe through a slot. When this laser beam is seen by an observer or potential rescuer, it shows up as a flash of light. According to the manufacturer, this should be visible at a distance of up to 16 nautical miles. Great advantage over the lasers is that the torches are visible from all sides. 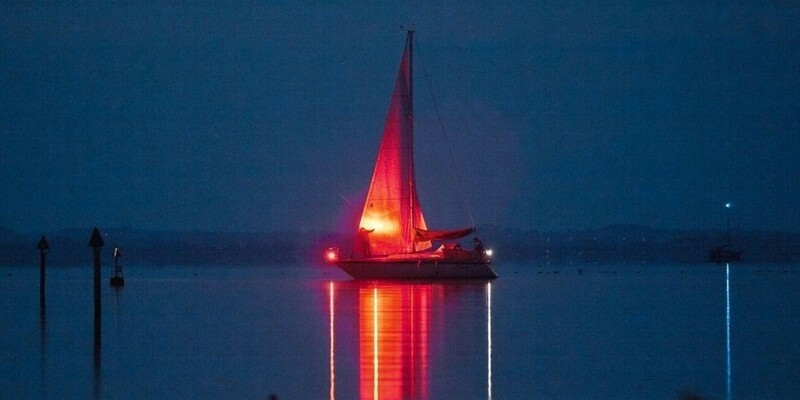 If the foresail is additionally illuminated, it reflects the light and increases the light point significantly. The Odeo Flare has a thread for camera tripods at the bottom, so it can be attached to the railing. This makes sense because the LEDs can attract the attention of potential helpers for over five hours. The Odeo Flare can also be equipped with conventional AA batteries. For the EDF1 there is a suitable spare battery, it costs 30 euros. Luckily, we had agreed before the test with the Sea Rescue, because an angler had recognized the SOS signal and called the headquarters in Bremen. In an emergency, that would have been the salvation. Click here to read more.